The Adams Direct Drive Rotary Blender features a 10-gauge 304 stainless steel drum and 60 hp motor. Curious weather seems to be playing some role in the run-up to this year’s fertilizer blending and application season. At presstime, many dealers were being yanked between brutal winter conditions and moderating temperatures. For instance, Bruce Hinkeldey with Ranco Fertiservice says his firm’s sales territory (including the Dakotas, Iowa, Nebraska and Minnesota) did not have snow on the ground and dealers were still applying fertilizer and lime. Rob Henderson, vice president of sales and marketing at Waconia Manufacturing, reports that in many areas growers did not apply fall fertilizer because of fluctuating prices and a belief that fertilizer prices would come down. Another factor to consider is that growers are able to plant fields much faster these days, he points out. “This will cause high stress on fertilizer dealers to apply many more acres than usual in a normally short spring,” he says. Less-than-ideal weather conditions can also lead to a shorter window to get fertilizer to the field. “That poses several challenges, including speed, flexibility and how to maintain blend quality when under the gun to get tons out the door,” says Charles Formisani, vice president, sales with A.J. Sackett and Son Co.
New fertilizer products, including micronutrients and nitrogen stabilizers and enhancers, continue to grow in popularity with growers, and blender companies are adapting. “The beauty of our system is that we can just add things on with no problem. Dealers just order the impregnation pump, we get it installed and away they go,” says Hinkeldey. “We see the demand for prescription blends and impregnation of enhanced efficiency coatings to continue to increase,” says Formisani. He also says many retailers are using more micronutrients in different forms, such liquids and powders. Hence, many dealers are coming to A.J. Sackett with the question of how can they add value to their dry blends but maintain very high quality and not give up too much speed. In an answer, Sackett developed a technology called Precision Fertilizer Blending (a registered name) now featured in its H.I.M or High Intensity Mixer (see slideshow). In fact, the mixer recently won the ARA/Ag Gateway Technology Contest, which gives retailers the opportunity to vote for the best ag technology they see for their businesses. Formisani says the blender does several things, all designed around the Precision Fertilizer Blending concept. First, it allows retailers to formulate simple or complex fertilizer mixes while being gentle on materials. It’s also able to efficiently incorporate value-added products into blends, giving retailers the flexibility they need. Products such as Agrotain, AVAIL, new polymer coatings, liquid micronutrients and powders can now be added, allowing growers to reap additional yield and environmental benefits. Formisani adds that the H.I.M is built for heavy duty service and high capacity and high tonnage output needs. Overall, getting more product through more quickly continues to be an important factor for blender buyers. Henderson says Waconia is now designing a system with more storage that provides higher throughput capacities. And everybody wants larger bins, says Hinkeldey — and that means larger capacity metering units as well. One example of the speed that’s possible these days can be seen in the Layco Volumetric and Declining Weigh Blender, which at one dealership enabled loading times of semi truck trailers to be slashed to as little as five minutes, says Anne Sheehy, senior vice president, sales and marketing, at Yargus Manufacturing. The unit also features stainless steel rotary valves (which make the system easy to clean and service) to meter product, as well as a PLC computer to control NPK ingredients. Adams Fertilizer Equipment recognized the need for “lightning” blend and unload speeds when the company designed its Direct Drive Rotary Blender, says Shawn Hudspeth. 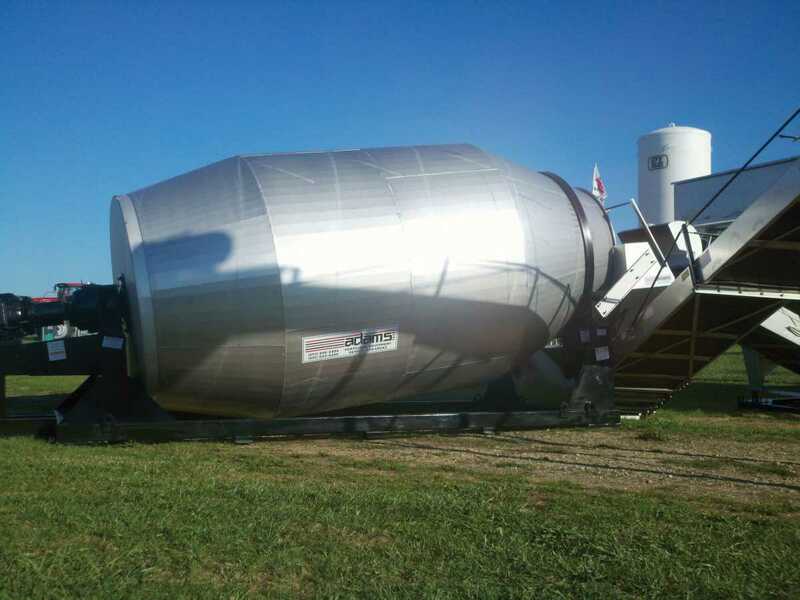 For instance, at a fully loaded capacity, the firm’s 13-ton unit takes only 1.5 minutes to move product from the weigh hopper to the blender drum — and it takes only 3.5 minutes to completely empty 26,000 pounds into a truck. Waconia’s Henderson says dry fertilizer equipment sales in general are strong, which is leading to longer lead times for equipment delivery. Dealers will absolutely need to look further ahead when planning for their equipment needs, he emphasizes. Hinkeldey says the industry seems to be entering a period when more and more older units need to be replaced. For instance, many of Ranco’s customers who started with the company’s volumentric blenders some 30 years ago are coming back for the firm’s Declining Weigh (DW) system. With the volumetric system, density changes in the mix made it a little more challenging to hit the right load, but with the DW system batches can now be “right on the button,” he says. Doyle explains trade-ins are also an option, where some customers may be trading in an 8- or 10-ton vertical upright for a 13-ton vertical or rotary blender. In fact, some buyers — who keep a great maintenance program — want to trade in blenders every three to five years. Overall, Doyle puts the lifespan of most blenders at about 12 to 18 years, depending on their tonnage and how well they’ve been taken care of. Indeed, decisions about replacing blenders and other high-ticket equipment will continue to be a challenge for retailers. “Dealers need to try and predict what their business will look like 10 years down the road. That’s a challenge especially when building new or upgrading equipment,” says Formisani. Take a look at the longevity of blenders, says Hinkeldey. Price shouldn’t always be the determining factor in a purchase. “Take a look at the quality of the build, the history of the equipment that’s been out there before — how long it’s lasted. Get something that’s very well-built and it will pay you back,” he says. In extensive travels to both retailer and farmer events, Doyle finds a mood of uncertainty. Growers see a stalled Farm Bill and lower commodity prices — but no answering price adjustments on crop inputs such as chemicals and seed.